Precision cleaning system - SHIRAI TECH, LIMITED. 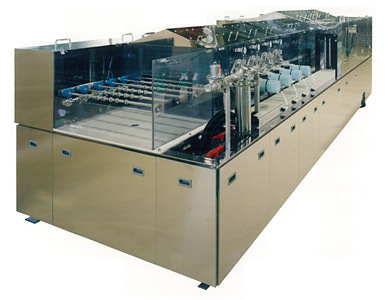 This machine is used for cleaning FPD glass substrates. The cleaning process mainly consists of the substrate cleaning and panel cleaning process, with each being cleaned either automatically or semi-automatically. As each machine is custom-made, we will reflect all requests from the customer to build an efficient cleaning system which best suits the customer's needs. City water, pure water, HPS (High pulse spray system) / HPR (High pressure pure-water rinsing) cleaning, etc. can be combined and used. Cup-brush method, roll-brush method, etc. Air knife + Slanted air knife (for the back edge of the panel) drying type (PAT.P). Loader and unloader units can also be built onto the machine.